It’s time for Thanksgiving, and your life is probably getting a liiiiiiittle crazy. We host Thanksgiving every year, and we have to plan around my parents, my sister and her family, my brother, and my ex-husband and his family since we coparent through the holidays. I would love to say that Thanksgiving is always a beautiful and fancy sit down dinner. Reality? It’s not Thanksgiving around here without an autism meltdown. We are thankful that we can host a sensory friendly Thanksgiving since we’re at home and so used to meeting A-Man’s sensory needs, but what about those who don’t know anything about hosting an autism-friendly Thanksgiving? Maybe your nephew or granddaughter is autistic. Maybe they’re newly diagnosed and you’re trying to make this holiday season go as smoothly as possible. First, a big thank you from this autistic autism mama! Just the fact that you’re planning on hosting an autism-friendly Thanksgiving means that your Thanksgiving holiday is already going to be better for your autistic family member than they’re used to. It means the world when family does their best to make their home a safe place for autistic kids (and adults)! So let’s chat about some practical tips for hosting an autism-friendly Thanksgiving! I cannot express how huge this is. So many things can be made better by simply planning. My poor husband teases me because I. plan. everything. I know exactly what time everything is happening. I know who needs to be where and when. I plan, and plan, and plan. If you are thinking about hosting an autism-friendly Thanksgiving, you’ve got to plan too. 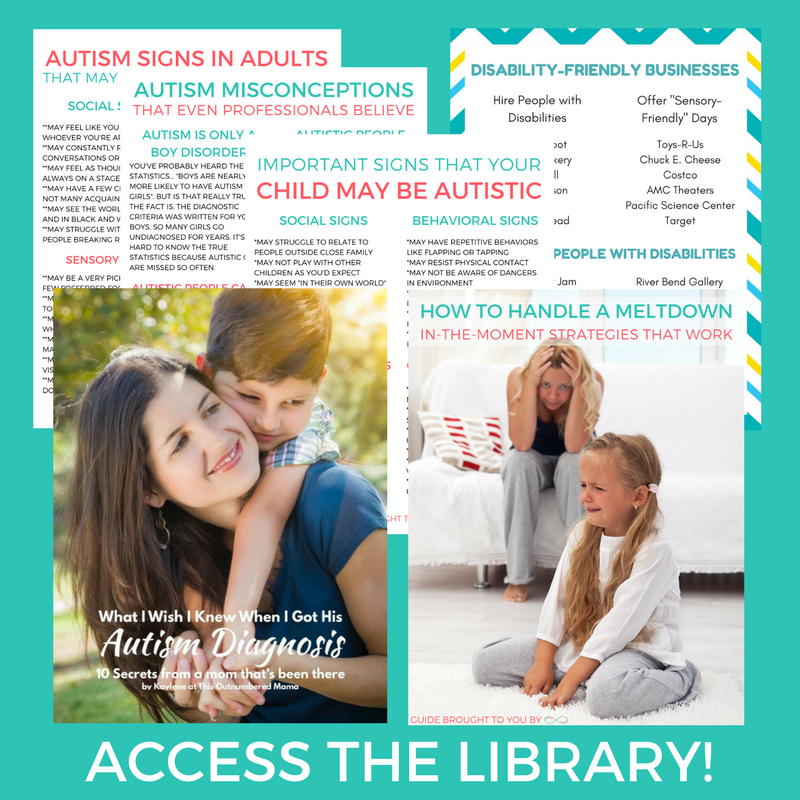 Talk with the autistic person (or their parents) about different ways that you can help. Do they need a certain meal? Do they need a quiet place to escape? Now, we’ll cover all of these in greater detail, but the thing to know now is that you’re going to have to plan. Lots of autistic kids really struggle with eating certain foods. A-Man has an extremely limited diet, and the traditional Thanksgiving meal is definitely not included in that limited diet. Find out what types of foods you should have available in addition to your Thanksgiving favorites. I know that many of us grew up with the rule that no one should ever have to make two dinners, but when hosting an autism-friendly holiday you need to prepare for two dinners (or at least some hefty snacks). For A-Man we do well with bread products, so he eats a lot of Hawaiian rolls, and we typically make him a sandwich for his “meal”. Just ask what types of foods you can have on hand, and your Thanksgiving will be much more autism-friendly. The fact is, holidays can cause some pretty serious meltdowns. It’s so, so, so important to truly understand sensory meltdowns if you’re hosting an autism-friendly Thanksgiving. And it’s even better if you help your family understand sensory meltdowns as well. The biggest thing to understand is that there’s a huge difference between a tantrum and a sensory meltdown. An autistic child having a meltdown at Thanksgiving is overwhelmed and can’t handle the change of routine and environment, they’re not a “brat”. You can print out these sensory meltdown awareness cards to hand to well-meaning family who may not understand what’s happening. More than anything, let the autistic child and their parents know that you understand and have no problem if there’s a meltdown, you’re just there to help! On top of strong food preferences, many autistics have very strong sensory needs, and with a little planning you can help to meet those needs at your autism-friendly Thanksgiving! The first (and most important step) to planning for sensory needs is to ask the autistic person and/or their parent about their sensory needs and preferences. See, it’s not super helpful if you make some sensory slime if the kiddo can’t handle the texture of slime. Or if you offer a fidget spinner when the kiddo can’t tolerate the whirring noise. So ask the kid or the parent (or both!) what types of things would help to have available. Have some headphones on hand for if noises are overwhelming. Keep one room off-limits to everyone so that the autistic kid has a safe place to escape. Have a preferred toy/activity readily available for them to use. I know the picture perfect Thanksgiving dinner that people picture when they plan on hosting Thanksgiving. Take some time to consider that your autism-friendly Thanksgiving probably isn’t going to look like that. We don’t need a quiet sit down dinner where everyone dresses in fancy clothes and happily eats everything at the table. Thanksgiving is about being thankful for our family, our friends. That includes being accepting and loving to our friends and family, even if they don’t fit your picture of the ideal Thanksgiving holiday. Another time this becomes important is with setting the expectations for other kids in the family. It can seem pretty unfair if Timmy has to eat his veggies before having a slice of pie but Tommy can eat nothing but snack foods all day long. 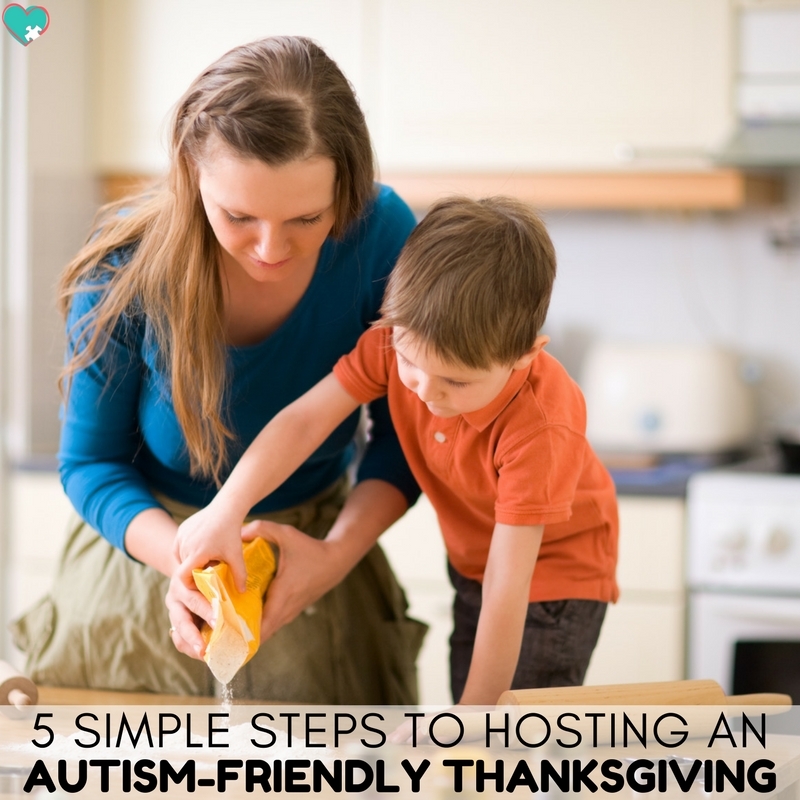 With these simple steps you will be an expert at hosting an autism-friendly Thanksgiving!